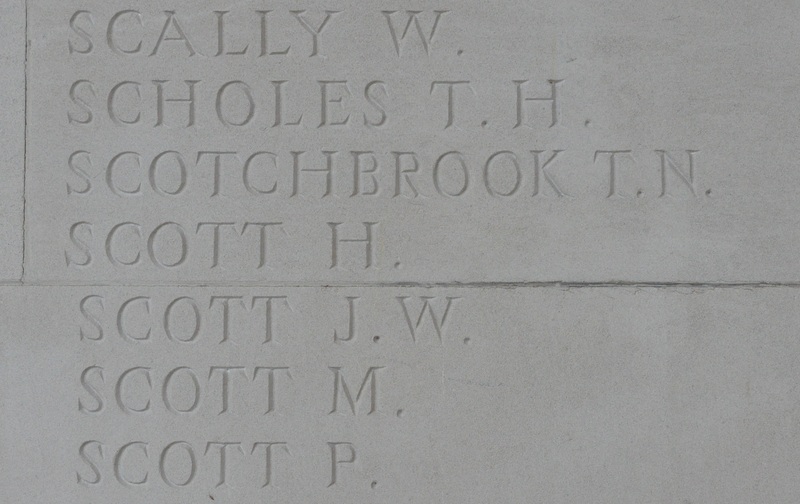 Hugh Scott joined the Northumberland Fusiliers and was one of two sons of the Hove Borough Surveyor who were killed in France in 1917. Hugh Scott was born at 3 Cranbourne Street, Brighton on 30 March 1883, the first of six children born to Hugh Hamilton Scott (1855–1928) and his wife Agnes née Smith (1862–1941). Hugh Hamilton Scott originated from East Stonehouse (now a suburb of Plymouth) in Devon. After qualifying as an Associate Member of The Institution of Civil Engineers in May 1880, he was appointed the Borough Surveyor to the Hove Commissioners, a post he retained for a record 42 years, during which period Hove became a county borough. In the 1881 census, Hugh Hamilton Scott was lodging at 1 Pelham Square, Brighton. 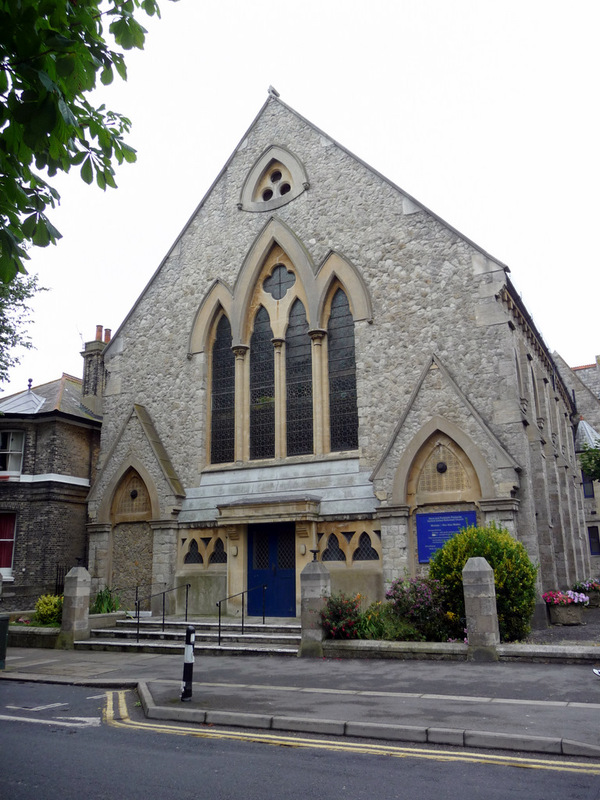 On 7 June 1882, at Preston Parish Church, Brighton he married Agnes Smith, the daughter of Henry Smith (1837–1914) a baker/biscuit manufacturer from Ship Street, Brighton. After their marriage, the couple lived initially at 3 Cranbourne Street, Brighton (close to the present-day Churchill Square) and then briefly at Waterloo Street in Hove, before settling at 44 Hova Villas, where Agnes lived for the rest of her life. Hugh was born on 30 March 1883, followed by twins Robert and Henry, born on 3 August 1884. A daughter, Marion, was born on 2 January 1888, with two other children dying as infants. Hugh and his brothers were all educated at Gloucester House (which became Hove High School in 1908, but closed in the late 1950s) at 49 Clarendon Villas, a short walk from the family home in Hova Villas. Although his father left Cliftonville Congregational Church in 1904, Hugh continued to worship there. He was Chaplain of the Boys’ Brigade and Sunday School secretary, and later became a deacon and the editor of the church magazine. At Cliftonville church on 16 October 1915, (aged 32) he married 38 year old Constance Winifred Spong, the daughter of the late Revd. Ambrose Daniel Spong (1844–1912) whose brother, James Osborn Spong (1839–1925), was the inventor of the food mincer named after him. Revd. Ambrose Spong had been the minister at Cliftonville church between 1863 and 1903. Described as a “remarkable clergyman”, he died at home from a heart attack in the evening of Christmas Day 1912, having preached a sermon earlier that day at the Wesleyan Church in Portland Road, on the topic “God so loved the world that he gave his only begotten Son”, before having Christmas dinner with the patients at Hove Hospital. After their marriage, Hugh and Winifred lived at her late parents’ home at 19 Ventnor Villas, Hove where their son, Anthony Ambrose Hugh Scott was born on 28 November 1916. Hugh followed in his father’s footsteps, becoming a registered student of The Institution of Civil Engineers on 23 March 1902. By 1908, he was still registered as a student with the institution but was now listed as resident at Balliol House, Wentworth Street, London, E1. Balliol Hose was part of Toynbee Hall, a pioneering social settlement, which aimed to bring university students and graduates to live and work as volunteers in London’s East End, “bringing them face to face with poverty”. At the time of the 1911 census, Hugh was again living at 44 Hova Villas with his parents, and now gave his occupation as a Civil Engineer, working on his own account. He subsequently returned to London, where he was in business as an Engineering Surveyor. Hugh’s uncle, Robert Smith Scott (1853–1952) was the Borough Surveyor at Bishop’s Stortford, Hertfordshire and was initiated into St Michael’s Lodge No 2136, meeting in Bishop’s Stortford, in September 1892. Hugh was initiated into Brighton’s Royal Clarence Lodge No 271 on 17 March 1916. He was passed to the second degree on 14 April and raised to the degree of a Master Mason on 19 May 1916. On 4 July 1916, Hugh enlisted at Hove, initially joining the Royal Engineers, but, after his training, he was transferred to the Northumberland Fusiliers, being assigned to the 25th (Tyneside Irish) Battalion, with service number 47917. 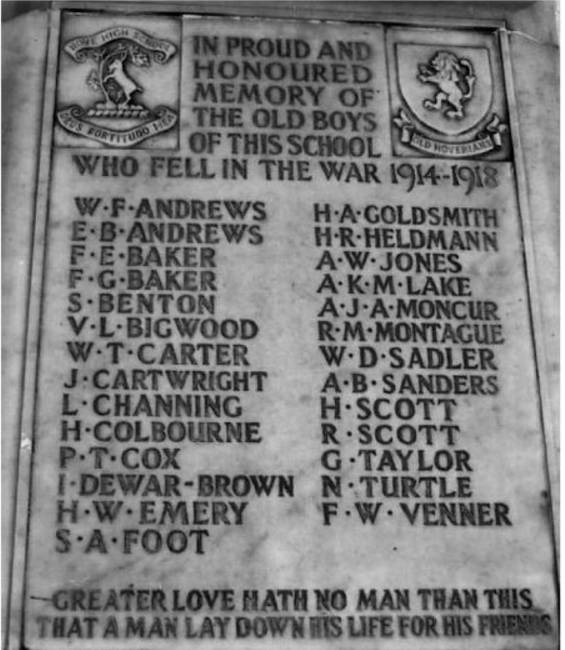 The Tyneside Irish battalions formed the 103rd Brigade of the ill-fated 34th Division which suffered the highest casualty rate on the opening day of the Battle of the Somme, losing 6,380 men, including 150 men killed in the 25th Battalion. After the Battle of the Somme, the 25th Battalion spent several months regrouping and reinforcing with fresh drafts of new recruits arriving in January 1917. In February 1917, the battalion were based at Moulle, near St. Omer, where they were engaged in training in trench construction, dealing with gas attacks etc., until 18 February, when they marched 60km south to Ecoivres and from there 40km east to Arras, where they arrived on 7 March. 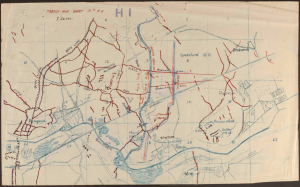 On 9 March, the battalion relieved the 23rd Battalion in the trenches at Roclincourt, 5km north of Arras, where they soon came under attack from enemy artillery. On 14 March, the battalion fought off a raid on their trenches, during which one officer and twelve men were killed, following which they were relieved and returned to billets in Arras. Over the next few days, the battalion were engaged in raids until 19 March, when they withdrew back to Ecoivres. After two days “rest”, the battalion moved again, 22km east to Villers-Brûlin. The battalion remained at Villers-Brûlin until 2 April, during which they underwent training, practicing trench assaults, attacking strong points etc. Here the men were able to relax slightly, with a church parade on Sunday 25 March and inter-company football matches on 29/30 March. On 6 April, the battalion were back in the trenches at Roclincourt from where, on 9 April (Easter Monday), they launched an assault on the enemy trenches successfully capturing their objective, but suffering heavy casualties, with 5 officers and 45 other ranks being killed. The battalion spent the next four days consolidating their new position, until they were relieved on 14 April, when they withdrew to Marquay, 31km to the west. 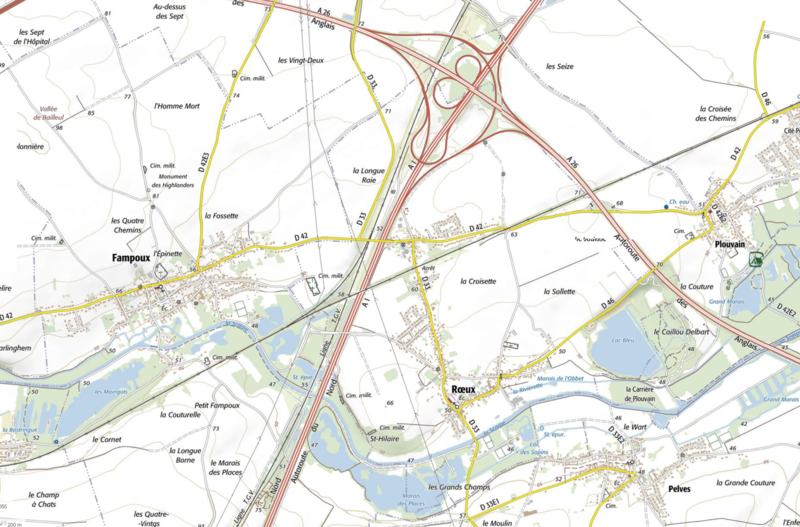 At Marquay, the battalion again underwent training before returning to the Arras region on 21 April, and entering the trenches near Fampoux, on the banks of the River Scarpe, on 24 April. After a failed attempt to remove the enemy forces from the chemical works near Rouex the battalion withdrew to the Oppy line of trenches to the north of Fampoux. On 27 April, the battalion were once again ordered to attack as part of what became known as the Battle of Arleux. This was largely a diversionary tactic, to tie down German reserves and relieve pressure on the French army. Although the Canadians made small gains at the village of Arleux-en-Gohelle, the action around Fampoux was a failure resulting in heavy casualties amongst the British forces. 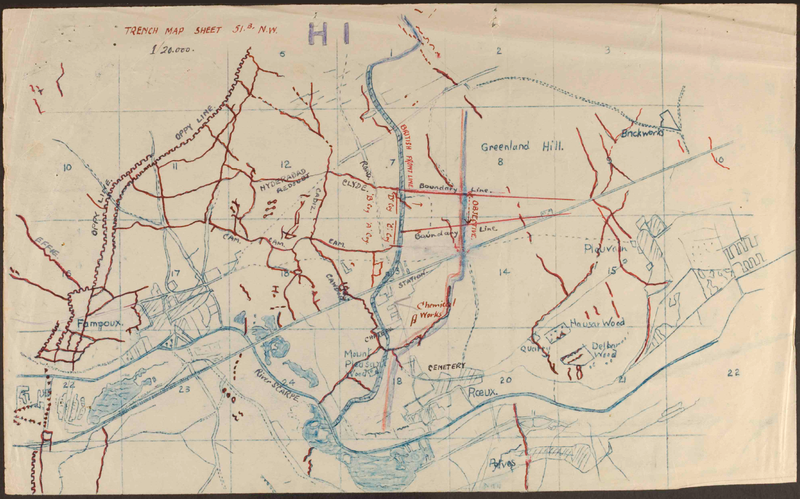 The battalion in Oppy Line – Ordered to move forward to front line to attack tomorrow morning. Zero hour fixed for 4:25 a.m. Moved forward at 10 p.m. relieving 27th Bn. Northd Fusrs. The positions were as follows: Two companies – ‘C’ & ‘D’ in front line & two companies ‘A’ & ‘B’ immediately behind the road. The line was from I.7 c.8.8 to I.13 c.8.5, 150 yards north of the junction of Cam trench and front line to Clyde. An observation post was established at about I.7 c.8.6. The attack commenced at 4:25 a.m. ‘C’ Company on right supported by ‘A’ Coy, and ‘D’ Coy on left supported by ‘B’ Coy. Heavy machine gun & rifle fire was immediately encountered from an unregistered enemy trench 200 yards to East of our line and also from the chemical works and other buildings, holding up the attacking troops on our right 15 yards from our front line. The 24th Bn. Northd Fusrs, who were advancing on our right flank suffered very heavily from this fire. The Battalion reached all objectives on the left flank and commenced to dig in but the fire from the enemy trench made the work very difficult. A German counter-attack was made on the brigade on our right at 11 a.m. south of the railway, by about 600 men who succeeded in passing our front line. They were, however, practically annihilated by machine gun and artillery near Mount Pleasant Wood. After dark, the battalion returned to the front line as it was in danger of being cut off by parties of the enemy who were working round the flanks. The men were collected by Capt. Wright and 2nd Lt. Kirkup who were the only company officers to come out of the attack unwounded. The casualties were: Officers, killed 1, wounded 3 and missing 5. Other ranks, killed 15, wounded 63 and 57 missing, total 135, out of total 13 Officers and 278 O.R.s. 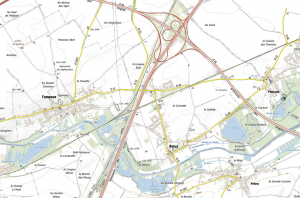 The area where Hugh and his comrades were killed now lies under the junction of the A1 (Paris to Belgium) and A36 (Calais to Reims) motorways and is also crossed by the Paris to Lille TGV railway. 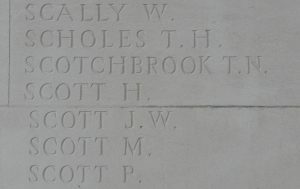 The Commonwealth War Graves Commission records show that five officers and 80 men from the 25th (Tyneside Irish) Battalion of the Northumberland Fusiliers were killed on 28 April 1917, of whom 76, including Private Hugh Scott, are commemorated on the Arras Memorial situated in the Faubourg-d’Amiens Cemetery. The memorial commemorates almost 35,000 servicemen from the United Kingdom, South Africa and New Zealand who died in the Arras sector and have no known grave. 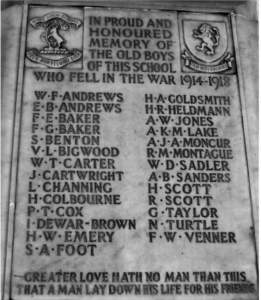 As well as the Masonic Roll of Honour, Hugh is commemorated alongside his younger brother, Robert, on both the Hove Library War Memorial and on the war memorial plaque in the entrance hall of the former Hove High School. Hugh’s younger brother, Robert, qualified as an architect and migrated to Canada before the war and in March 1915 he enlisted in the 72nd Battalion (Seaforth Highlanders of Canada). He was killed on 1 March 1917 in the Canadian assault on Vimy Ridge, 15km north-west of where Hugh was killed eight weeks later. Hugh’s widow, Winifred, did not re-marry and continued to live at 19 Ventnor Villas, Hove until her death on 18 November 1960, aged 84. Their son, Anthony Ambrose Hugh Scott married Ruth Bennett in 1948, and died in January 2004. His daughter, Keren (Hancox) followed her father and grandmother in becoming secretary to the Hove Central United Reformed Church. The Wartime Memories Project: Northumberland Fusiliers 25th (2nd Tyneside Irish) Battn.